I really liked this story. This is a story of 6 friends. It is the telling of the events that lead up to the death of one of the friends, the death itself, and the aftermath of that death. There are layers and layers of nice, dark, deep, pathological juicy bits to go though. So much to keep you up late at night to think about. You’ll be thinking about this book all the time you read it…but you won’t stop thinking about it during the times you have to set it aside for the *real* world. 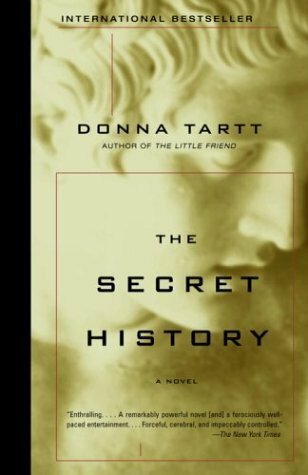 But let me be honest here….as much as I loved the story, and no matter how much I enjoyed these very…errr…unusual characters, I just don’t care for Ms. Tartt’s writing style. It’s tough for me. I absolutely loved “The Goldfinch”. Much more than I liked this one. However, I felt the exact same. I love books that go into great detail. I loved longer books. But having said that, the details I think Ms. Tartt goes into just aren’t the ones I need to know. I find bits of her stories very very very VERY repetitive. The bits I want more details to, I think she just skims over them or gives us just the barest of bit of knowledge she can to get on to the boring bits. I find myself just tapping tapping tapping my feet, waiting for her to get all those nonsense words out of her mouth and get back to the really relevant bits.